How is everyone being impacted by the AWS outage today? WOW. I am not a networking guy, but dang that's a lot of ways in, to bad that NetPath shows that the route into AWS is good. Next up is Pingdom. Sure enough it shows it as down. So how did/is the AWS outrage impacting you? GNS3 Talks: Use the NAT node to connect GNS3 to the Internet easily! Starting with GNS3 2.0 a NAT node is available. This node allows you to a connect a GNS3 topology to the Internet via a NAT. But your topology is not accessible from the internet. 2017 SolarWinds THWACK MVPs Announced! Please join us in congratulating 14 community members who have reached the ranks of the elite SolarWinds THWACK MVPs! Also deserving of recognition are the 47 folks who renewed their MVP status for yet another year, some of which have been apart of the MVPs for 5+ years! In case you haven't already come across these folks in your conversations here on THWACK, below is a brief introduction for our 14 new MVPs. Be sure to connect with them and the rest of our MVP roster, they are a power house of knowledge and SolarWinds how-to, best practices, etc. You can find the full list of MVPs and learn more about how you can join the program here. Celebrations are in order! Congratulations from all of us here at SolarWinds and the THWACK Community! You have successfully begun your journey to the cloud. You have learned by now that SolarWinds Monitoring Cloud is a suite of SaaS products that helps you solve complex performance and reliability problems with your cloud infrastructure or apps. Continue your journey to the cloud! Monitor performance of your distributed apps across your full application stack. Make your website faster and more reliable with powerful, easy-to-use uptime and performance monitoring. I was summoned to the CEO’s office on the 13th floor. My ears popped as the elevator lurched upward. As the door to his office creaked open revealing a gruesome scene, I felt my heart drop to the floor. I saw my old friend; Mr. A.P.P. Lication there on the desk lifeless, completely frozen, and by the looks of our dazed CEO, for a very long time. Not DOA, but APP’s condition was critical, unresponsive to my desperate command prompts. I knew if I were ever going to have another Exchange with my old friend (or keep my job) I’d have to get to the root of this mystery and fast. THWACKsters, we need your help! Use the Appstack™ mystery-solving tools provided in this mission to get to the bottom of the slowdowns. Correctly answer all 20 questions over the course of the month and you'll be entered to win the Grand Prize: An Adabox Subscription! A new question will open every day (Monday - Friday) starting on February 6, 2017. Once a question has opened, it will remain open until March 5, 2017 at 11:59 p.m. Complete the mission shortcut to earn up to an additional 3,000 THWACK points & enter to win a THWACK Fridge (Worth 80,000 THWACK points)! 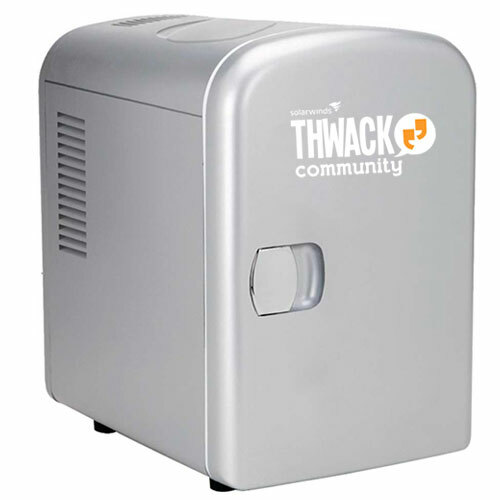 Earn 1,000 THWACK points per product & enter to win a THWACK Fridge!